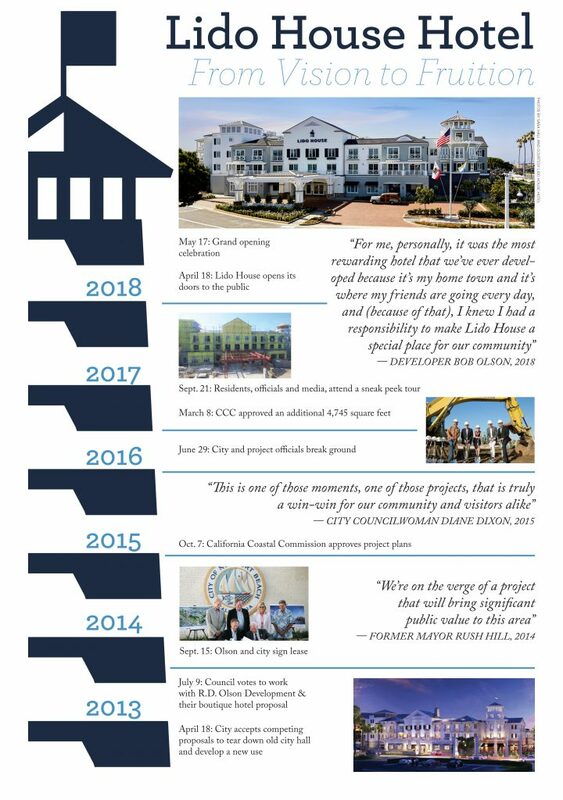 Exactly five years after submitting their proposal for a boutique hotel on the old Newport Beach city hall site, the Lido House Hotel opened its doors to the public. The “Newport nautical” architecture and design of the property, described as Cape Cod with a Newport Beach twist, is similar in style to the little Balboa Island home of Bob Olson, CEO of R.D. Olson Development, the company building the boutique hotel on the Balboa Peninsula. The original concept of the hotel evoked an emotional response from the locals, Olson said in an email this week. “The original vision of the architecture and, in particular, the guest entry arrival, was incredibly important to me as I thought it resonated with our community,” Olson noted. Out of the 21 hotels his company has developed, Lido House was the most rewarding for Olson, he noted, because it’s home and he felt a responsibility to make it special. And the five year process was fairly fast for this type of project, he added. “Developing Lido House, a very complicated project, in five years is relatively quick given the approval process, the planning required and the detailed construction,” he explained. Lido House will never be “completed,” Olson pointed out. They’ve also opened some of the outlets after the hotel doors opened: TopSide rooftop bar and Crew Coffee+Creamerie.